As communities grow and populations age, there are many challenges that are clear for all to see. But there are still some challenges that remain hidden if you haven't had to walk the walk. This winter, however, you hardly have to look past the end of your driveway. Many seniors living in their homes simply aren't able to physically shovel the snow on their driveways or clear pathways in and out of their house, and this is where Neighbourhood Network, the Aurora-based organization that links community volunteers with individuals in need, steps in. But the organization can only go so far without your help. 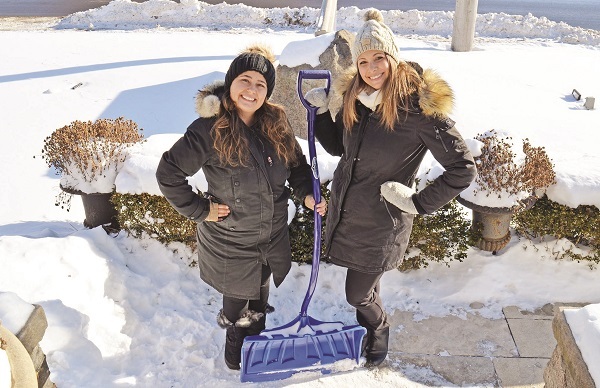 Neighbourhood Network is at the height of its annual Winter Snow Removal Campaign, a program which links seniors and residents living with physical challenges to nearby volunteers who are ready to lend a hand, pick up a shovel, and clear pathways in and out of homes for residents and caregivers. With the growth this community is experiencing, however, the need is more acute now than ever before and Neighbourhood Network is encouraging volunteers to sign up to battle the snow. The concept is simple: Neighbourhood Network asks for any and all willing volunteers and they are matched with someone in their area – ideally no more than a 10 minute walking distance from their homes, unless you're willing to drive – that needs a helping hand. “The idea is to get to know your neighbours and help people who are right there in your community, close by,” says Ms. Cerenzia. As far as eligible seniors and persons with disabilities, there is more specific criteria. The program is geared specifically towards low-income seniors who wouldn't otherwise have the means to hire someone to clear their snow. If you're just looking for someone to come by and clear your windrow, for instance, this program is not for you. While the program is available to persons with disabilities, proof that you're not physically able to remove your snow will need to be provided. “It is always important for everyone to understand that this is a volunteer-driven program,” says Ms. Cerenzia. “We will take your application, put you through a screening process and then as soon as we have a volunteer who is able to come by and provide the clearing services for you – and we can't guarantee that we will – we will send them over to you. “The volunteer is not required to clear the whole driveway,” she adds, noting this is a common misconception when it comes to the winter snow removal program. “It is really to give that senior or person with a disability access to get in and out of their house, or have a caregiver come in and out of the house, clearing a pathway that is safe for them to walk, clearing the Town's sidewalks, and that really annoying windrow that the snow plow leaves at the end of the driveway. It is also a simple way for students to collect the community service hours they need to graduate high school. For more information on how to sign up for Neighbourhood Network's Winter Snow Removal program as a client or as a volunteer, visit neighbourhoodnetwork.org or call 905-726-3737. Recipients must be residents of Aurora, King, Newmarket, East Gwillimbury or Georgina, 65 years of age or older (low-income seniors who receive a Seniors Tax Credit are given priority). Residents with a disability documented by ODSP are also eligible. There must be no able-bodied adults living at the address in question. Excerpt: As communities grow and populations age, there are many challenges that are clear for all to see. But there are still some challenges that remain hidden if you haven’t had to walk the walk.